HBM Test and Measurement (HBM) will be showing all-in-one solutions for measuring electrical and mechanical quantities at the leading trade fair for measurement technology, Sensor+Test, in Nuremberg, Germany from 05/10 – 12. 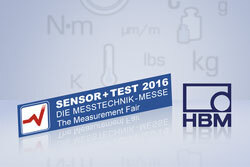 HBM will show its entire portfolio of sensors and transducers, measuring amplifiers and data acquisition software, as well as offers in service and calibration at Sensor+Test. HBM will also be presenting several new products, including sensor systems for extreme ambient conditions, an innovative multicomponent force transducer and a modular data acquisition device for battery tests. Visitors can find these and other product highlights at the HBM stand, 1-260 in building 1. On Wednesday, 11/05, HBM will present guest speakers on two topics at the Innovative Testing Forum: Force Measurements at Temperatures up to 300 °C will be presented at 9:30 am, followed at 1:30 pm by Durability Testing with Fiber-Bragg Grating Transducers. Other presentations by HBM will take place over the three days of Sensor+Test at specialist forums in buildings 1 and 5. Daily live shows will feature installations of a wide range of electrical and optical torque strain gauges. Theme islands will focus on special application areas including high-speed measurements, optical and process measurement technology and high-precision measurements.